Fast forward to this era, and they are still in the cake scene. Except now, there are many different sizes and shapes to choose from! I still choose the classic 10 inch bundt cake, in fact I have my mom’s pan from back in the day, lol! Sturdy aluminum, it still bakes up great bundt cakes. 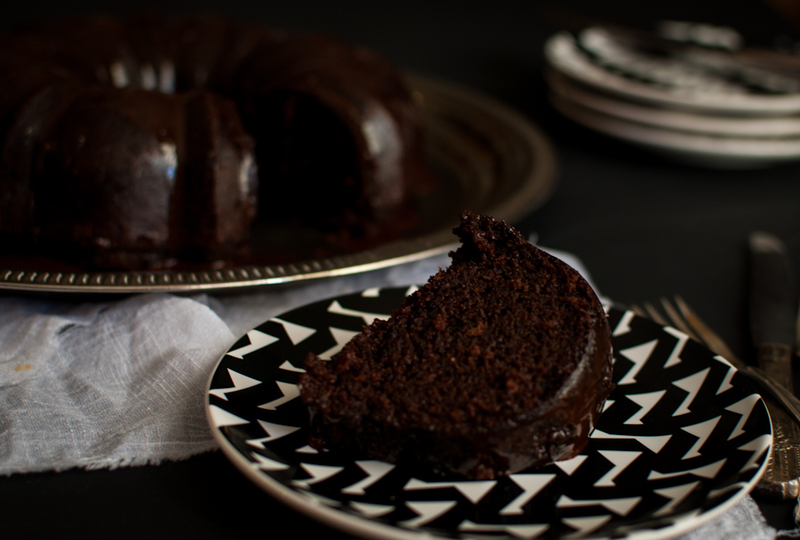 Nordic Ware knows how to make a great sturdy cake pan…. If your mom was like my mom, she probably used a box cake mix. That’s just how they did things back then! Maybe it was the easy, simplicity, and quick way of making things in the kitchen? My mother did have a cookbook or two, but most of the time it was boxed and canned foods. Another mystery of the 80’s we will never find the answer to! This cake is so simple and easy, you can have it in the oven within 40 minutes! Adapted from The Dahlia Bakery cookbook ( that Tom Douglas is such a genius!) It’s very moist and full of chocolate! The secret is russet potatoes, yes -you read that right! 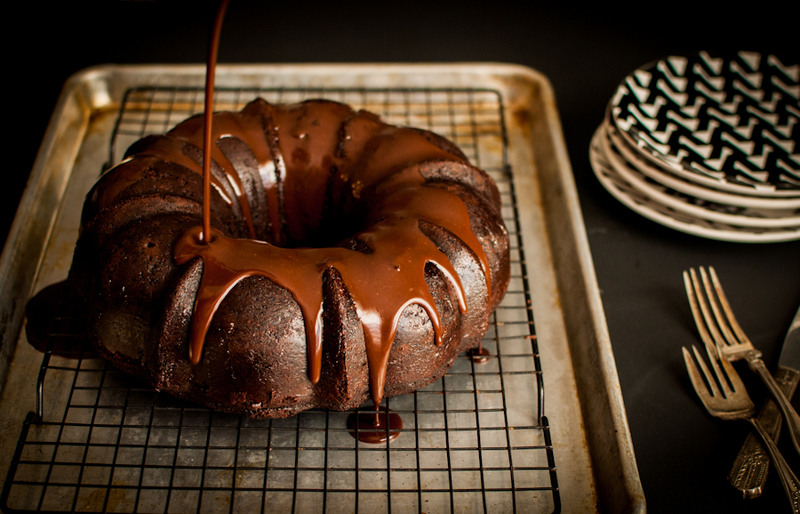 The chocolate glaze is chocolatey with a touch of honey and compliments this cake perfectly! Make sure you use a high quality chocolate, I like to use Ghiradelli. There are many high quality chocolates to choose from now. I love making cakes like this…mix, bake, and forget about it. Super easy, but tastes really really good! 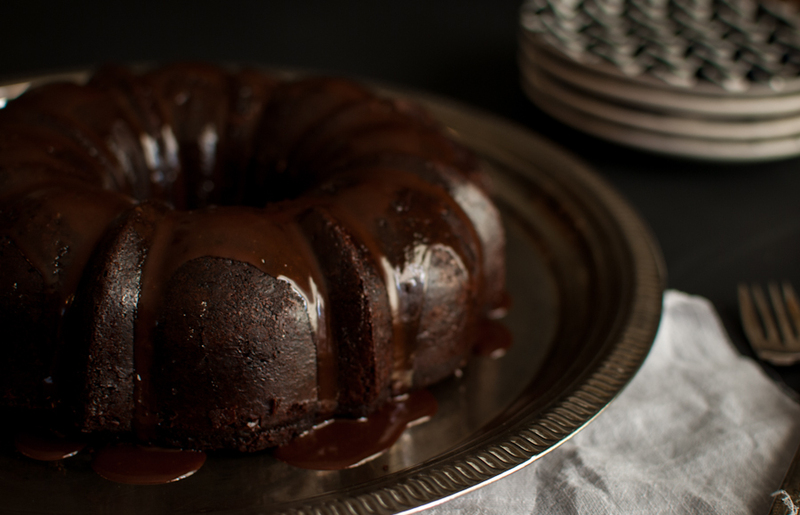 Grab your mother’s bundt pan, some chocolate, and a glass of red wine, and bake this cake like now! Peel potatoes and cut them into 1 inch pieces. Place potatoes in a large pot of boiling water. Boil until soft but not mushy. About 8-10 minutes. Drain potatoes and place thru a ricer or food mill. You should have about 1 cup of riced potatoes. Mix 2 Tbsp of flour and cocoa powder together. Butter a 10 inch bundt pan and dust with flour and cocoa powder. Put the bundt pan in the fridge until ready to use. Sift the remaining flour and baking soda in a large bowl. Stir in the salt and pepper. Set aside. Combine chocolate and honey in a medium bowl, pour the boiling water on top and let is sit for a few minutes to melt the chocolate. Whisk the mixture slowly until all combined. Set aside. In a large mixing bowl with the paddle attachment, mix the butter and shortening together on high speed until pale, about 2 minutes. Scrape down the bowl, and add the sugar, cream together for about 2 minutes. Add the eggs one at a time, mixing well after each addition. Next add the vanilla. Now add the riced potato and mix on medium just until combined. Add the honey chocolate mix and mix slowly. Now add the dry ingredients in three additions, alternating with the water. Mix slowly, and do not over mix. Run a spatula down the side and fold batter a few times. Batter will be very thick. Pour into prepared bundt pan and tap on the counter a few times to release any air bubbles. Bake for 65-70 minutes. The top will look crackly and dark. A wooden skewer should come out clean. Place pan on a cooling rack, allow cake to cool for 15 minutes before removing from pan. To remove from pan, place a plate on top and flip the pan over. Cake should slowly come out. Let completely cool before glazing. Put the chocolate and butter in a heatproof bowl, place the bowl over a saucepan of gently simmering water. The bottom of the bowl should not touch the water. Melt the chocolate, stirring frequently. When melted, remove bowl from the pot. In a small saucepan, add the half n half and warm over medium low heat. Do not boil. Add the half n half to the chocolate mixture, whisking until smooth. Add the honey, vanilla, and salt whisking until combined. Allow glaze to cool for 5-10 minutes. Pour glaze over cake, let set for 30 minutes before slicing cake. Makes 2 cups of glaze, enough for one bundt cake. That looks awesome! I am hosting a party tonight and was looking for a great dessert, and I think this might be the winner! PS – I love those plates! Thanks Erin… I scored these plates at Target last winter on clearance! Potatoes! I have never tried that! Bread, yes, cake, no. I must!